Okay, this is kind of off topic and I’m sorry but I’m not. I will start by saying that I’m not affiliated with Ting in any way other than that I’m a happy customer and I’m hoping to save you some money. 6 months ago my husband and I switched from AT&T to Ting, trading in our AT&T iPhones (a 4S and 5) at Best Buy (for store credit), then buying used Sprint network iPhones (a 5 and 5S) on Glyde and Amazon (yes, buying a used phone was scary but both of them turned out to be fine). Our AT&T bill was ~$147/mo for two iPhones, one with unlimited data and another with 2gb, including a discount I got from my employer. 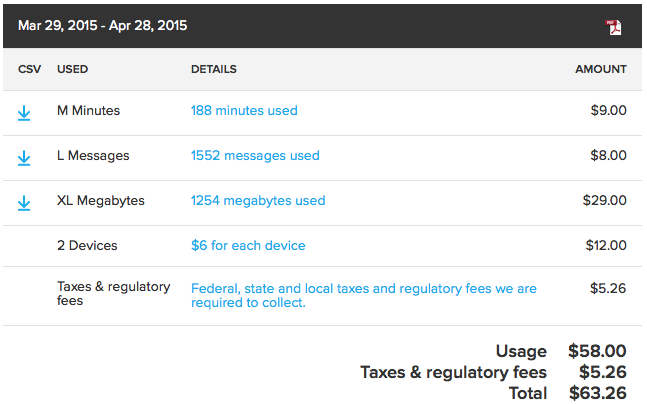 We had the lowest minutes plan (500), and did unlimited texts because we’re crazy texters. If you’ve never heard of Ting, it’s a mobile service provider that allows you to pay for your voice, data and texts in brackets. You don’t choose what you’re going to use ahead of time, you just use it and pay at the end of the month. They offer coverage on CDMA (Sprint) and GSM (they can’t disclose) networks, and although their maps don’t seem as hefty as AT&T’s coverage maps, we seem to have the same coverage we had with AT&T in our city. I was a bit worried about switching and losing my unlimited data, but using Ting’s savings calculator showed that even if we used the same amount of minutes, data and texts that we were currently using, we would save about $60 a month. They also send you updates about your usage when you pass a certain amount of usage (you decide what that threshold is). Six months at Ting has only cost us 2.3 month’s worth of AT&T bills. We have saved $544 in 6 months with Ting for our two iPhones. That’s almost enough to cover the two phones we bought when we switched to Ting. We have no contract with Ting, nor do we owe them anything for our phones. That’s pretty great when you think about how getting a ‘free’ phone at AT&T locks you in for 2 years. We could buy two iPhone 6s at $649 for our Ting accounts and have them paid off in 15 months using our savings from leaving AT&T. That leaves about $810 in savings for the extra 9 months we would have been stuck with AT&T to get the free iPhone 6s. I can’t say we haven’t changed our mobile habits, but I wouldn’t trade back for unlimited usage either. I block a lot of apps from using data, I don’t stream music on the road, and I don’t sit around idly flipping through Pinterest/Instagram/Reddit as much as I used to. We try to keep our usage below 1gb on each device and use wifi as much as possible. It sounds a bit ridiculous, but I feel like being mindful of my data usage has also made me more mindful in general. Even when we travel, our bill hasn’t gone past $65 for two devices. It’s nice to have control over how much we spend on our phones each month. Woops, we passed their 2gb data bracket and had to pay $.015 for each mb over. 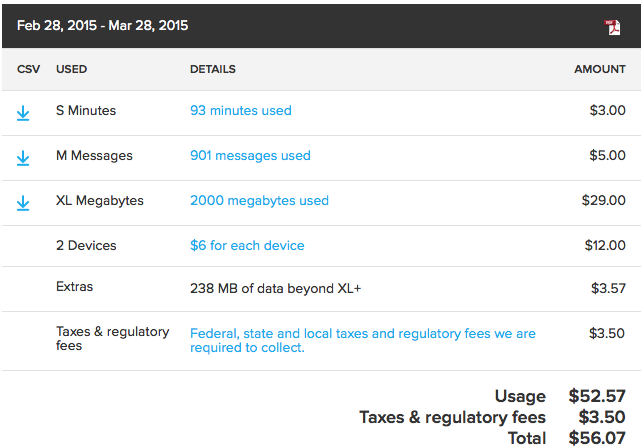 Looks like taxes went up and we went to the next text message & minute brackets, bumping our bill up a bit. I encourage you to check out Ting’s coverage maps, their savings calculator (plug in your monthly usage and find out how much it would cost at Ting), their rates (these are the ‘brackets’ I mentioned), and check to see if you can bring your current device with you to Ting. Do your own calculations and see if you’ll save money like we did (you may not). Think seriously, too, about changing your mobile habits. Download your music over wifi before leaving the house, same with your podcasts, videos, etc… Sure, it’s less convenient, but I can’t think of many situations where saving money is more convenient than spending it. Ting may not be for everyone: if you need data coverage in certain areas and they don’t have it; if you use more than 3gb of data each month it might end up costing more than your current plan; if you don’t have the money up-front for another phone, don’t want to downgrade, and your current phone can’t make the switch. If you think Ting would be a good switch for you, use the following link to get $25 in Ting credit. You can use this towards devices on their Shop page or towards your bills. I get a bit of money too! Anyone else switched to Ting recently? Still on the fence? Have an alternative? Let me know!